Berea on I-75 is a little bit hilly and a little bit Bluegrass. It is famous for its handmade crafts. Look for pottery, quilts and many other traditional Kentucky items. Down the road is the Renfro Valley entertainment complex with its music barn and some lovely views. If you have time while driving along the I-75 corridor, drop by Cumberland Falls, famous for its moonbow. Prestonsburg (near the Mountain Parkway in Eastern Kentucky) has (1) live outdoor theater at Jenny Wiley State Park, (2) a Mountain Arts center with celebrity and local talent, and (3)harness horse racing. Between Prestonsburg and Paintsville you will find the homeplace of country singer Loretta Lynn. There are several lively festivals in nearby counties including an apple festival, a sorghum festival and celebrations of pioneer life. If you are in extreme southeastern Kentucky, you might enjoy a trip through the tunnel at the Cumberland Gap area. Cumberland Gap is the site where many early pioneers, including Boone, traveled through in route to Kentucky. Morehead, the home of Morehead State University, is within a few miles of the Daniel Boone National Forest and Cave Run Lake. Cave Run Lake has excellent fishing (muskie, etc. ), craft shops, camping and hiking. Stop by the National Forest Visitor Center for interesting displays on the plants and animals of the area as well as maps and guides. 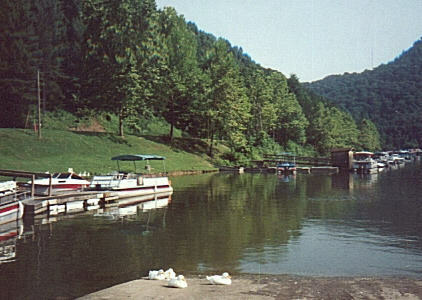 Cave Run Lake is host to a Cave Run Storytelling Festival in the fall which draws performers from many areas. Morehead has several local art or craft galleries including the Folk Art Museum, a project of Morehead State University. The city is a short drive away from Carter Caves State Park. Plans for a traditional music center are being made, and should provide a wonderful experience for visitors. Ashland is the home of the Paramount Arts Center which presents a series of musical programs ranging from the Everly Brothers to the Russian Kyiv Symphony Orchestra. Bill Ray Cyrus fans may remember it as the site of the Achy-Breaky Heart video. The City Park is beautiful and well worth visiting. State parks in the eastern area of the state include Carter Caves (606) 286-4411, Greenbo (606) 473-7324, and Jenny Wiley (606) 886-2711. Pike County Kentucky adjoins the area where Breaks Interstate Park, operated jointly by Kentucky and Virginia, is located. It is the site of the annual Hillbilly Days festival, voted one of the 10 best seasonal festivals in the state. Although the county was once a site of the famous Hatfield and McCoy feud, today it hosts a Hatfield-McCoy Reunion!